» Why should you use a blog? They could type your name right in, but that’s an audience you already have. They know who you are, you’re on their radar, and that doesn’t help you get more traffic. You could pay for traffic by buying an email list (don’t you dare! ), blasting them, and hoping some people open and clickthrough on the emails. But that’s expensive, and, you know, illegal. You could pay for traffic by placing paid search ads, which isn’t illegal, but still quite expensive. And the second you run out of money, your traffic stops coming, too. So … how can you drive any traffic? In short: blogging, social media, and search engines. Here’s how it works. Every time you write a blog post, it’s one more indexed page on your website. It’s also one more cue to Google and other search engines that your website is active and they should be checking in frequently to see what content you’ve published that they should surface. Every new indexed page is one more opportunity for you to show up in search engines, anddrive traffic to your website through organic search. We’ll get into more of the benefits of blogging on your SEO a bit later. 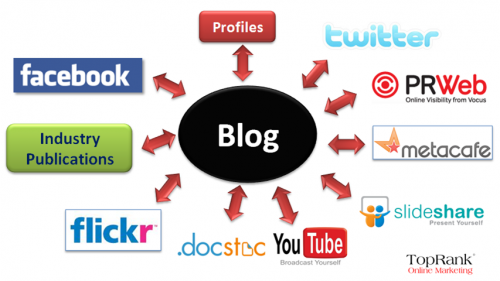 Blogging also helps you get discovered via social media. Every time you write a blog post, you’re creating content that people can share on social networks — Twitter, LinkedIn, Facebook, Pinterest, Google+ — which helps expose your business to a new audience that doesn’t know you yet. Blog content also helps keep your social media presence going — instead of asking your social media manager to come up with brand new original content for social media (or creating that content yourself), your blog can serve as that repository of content. You’re strengthening your social reach with blog content and driving new website visitors to your blog with your social channels. Quite a symbiotic relationship, if I do say so myself. Just like every blog post you write is another indexed page, each post is a new opportunity to generate new leads. And the way this works is really simple: Just add a lead-generating call-to-action to every blog post. If you scroll down in this blog post, you’ll see a call-to-action button. In fact, 99.9% of the blog posts we publish have call-to-action buttons … and yours should, too! That is how you turn that traffic coming to your blog into leads for your sales team. “Establishing authority” is a fluffy metric — certainly not as concrete as traffic and leads, but it’s pretty powerful stuff.